Mebyon Kernow seeks to build a society based on equality of opportunity, so that everyone has a fair chance to achieve their full potential in life. We want the freedom to create conditions in which Cornish businesses can be more successful, delivering worthwhile and secure employment, decent wages, access to genuinely affordable housing and good quality public services. 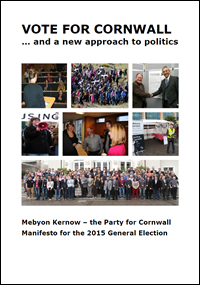 Mebyon Kernow believes that if we are to achieve a just and fair society we need effective public intervention to combat poverty, tackle social deprivation and fight for the rights and needs of the disadvantaged. We are determined to build strong inclusive communities providing free and equal access to well-funded education, healthcare and welfare services. Care for the environment is the foundation of an enduring, prosperous and balanced economy. It is central to the health of our population and the quality of our food production. For these reasons Mebyon Kernow will not shirk from difficult decisions to protect and enhance the environment for future generations. This should be a priority for all responsible administrations.